In this episode, Hackie Reitman, M.D. sits down with Ed Harrold, performance enhancement coach and motivational speaker. Ed is an amazing athlete who once swam 22 1/2 miles, and now dedicates his life to helping people achieve their goals. 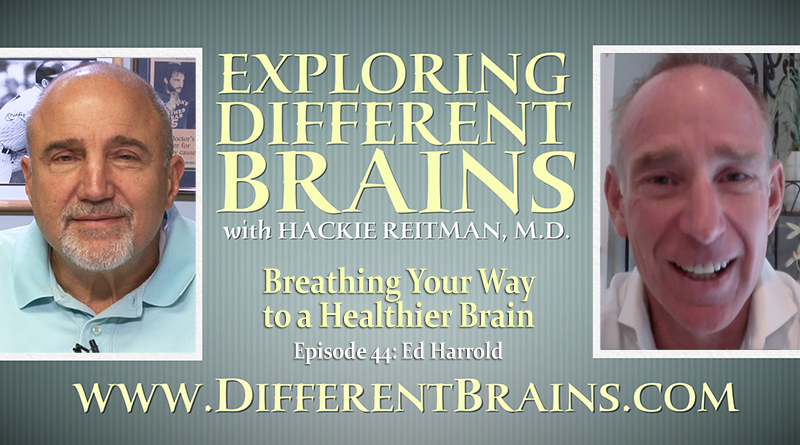 Ed talks about the amazing things proper breathing can do for the brain, the role neuroplasticity plays in enhancing performance, and the work he does with autism, ADHD, and other different brains. Hi, this is Hackie Reitman! Welcome to another episode of Exploring Different Brains. We’ve got with us today, Ed Harrold who is one of the breathing experts of the whole world. He’s a certified yoga instructor–I met him out in Aspen, we were both out in the Aspen Brain Lab, there, and he really–really knows a lot about the brain and breathing. Ed, Welcome to Exploring Different Brains! How are ya? I’m fantastic, Hackie, its great to be with you and your audience today. Well that’s great. Thanks for being here. Why don’t you introduce yourself to our ? I work in a few different platforms. I’m a performance enhancement coach, and I work with breath, I work with neuroscience, cardiovascular health and proper posture, G.I. issues, and I’m always looking to find that magic switch of zero balance, where everything just turns on in the brain–in the heart–in the spine. Where we can just live fully present; fully aware of all of our gifts. And I work in the healthcare industry where I have a CME training for physicians, I have a 25-hour and 100-hour for physicians who are under stress or burnout, or just feel like they’re overwhelmed. I work at corporate America, in regards to communication, reducing stress, improving energy levels and communication, and, obviously, creating revenue without all of us killing each other. I work in the athletic realms–in regards to athletes meeting their goals without the traditional wear and tear and the injuries we see in the older types of training that were brought to us in the 60’s, 70’s and 80’s. And I also work with individuals, in regard to having them fulfill their passions, fulfill their purpose, fulfill their dreams, and just relax and enjoy life. You know, Ed, on your website you talk about the point of greatness. Could you elaborate on that? Yeah, so the point of greatness is–well, for me, there is–there’s a piece of us that is obtainable when we can stop placing attention mentally and emotionally on parts of our psyche, on parts of our emotion that interfere with our greatness. I think every human being–regardless of skillsets, regardless of intellect or education, regardless of their social status is an amazing human being and has a purpose. And that purpose could be defined as a moment of greatness. Where something turns on to your personal or professional awareness. That had been missing up until this point in your life, and you’ll know it when you feel it. And when you feel that point of greatness, everything that you’re not, no longer has the same pull on your psychology or your biology. Now you swam 22-and-a-half miles when you were back in 94′. What was that like? Well that was an amazing journey where I took about 6 months of my life and I trained for a marathon swim. And the swim was around Atlantic City Beach, and its an island community of 22-and-a-half miles, and a lot of local legends have competed it in, but its also a world championship swim with professional swimmers. And it was–simply the fact that I wanted to do. I grew up on this island–it was an annual event every year. I was a good swimmer, wasn’t a great swimmer–so I took about 6 months of my life and I started to put some serious training in to trying to swim 22 and a half miles with these professional champions that came from all over the world. And I remember I started the race and everything was fine the first 7 miles. We were moving right along at 90 strokes a minute, and then around between 7 and 14 miles, my body and my brain was never on fire in as much intense pain as I felt for those several hours. And during that point, something inside of me died that was holding me back up into that point in my life, and something inside me turned on. And when it turned on, I had an immense power–psychologically–over my physiology, that allowed me to perform at a level that I was not accustomed to. So it took about 7 hours for my mental ego to be de-constructed. And then, around the 14 mile mark, with about 8 and a half miles to go, something inside me began to swim for me. And I basically was going for a ride. And I was back up to 90 strokes a minute, and I finished the race in 11 hours, 5 minutes and 6 seconds. I came in 14th out of 28 professional swimmers. And it was just one of those things in your life that you always have in the recall of your library of events in your life–when life gets tough–to know that when things start to go fast, you can pull back into this and realize that there is a super human energetic awareness inside of you–if you’ll just let it come forth. Well, that’s very well-said. I had 26 pro-heavyweight fights and I remember when my manager/trainer Tommy Torino was lacing me up for my first televised 10-rounder. I remember him saying, somewhere in these ten rounds, your character will be revealed and so will that of your opponent. I don’t believe he said that he said boxing builds character–I believe it reveals character. And when you hit that point that you just described in there, where that extra thng turned on, its almost like cheating. Because you have like an extra jet-fuel in there, and thats what it takes for you to be a champion. Yes, the brain is such an amazing organ, with its various parts and systems and organizations. And when all of the chit-chat is taken away, and all of the distractions and the shoulds and the coulds and the woulds–you know, you begin to see when you’re fighting or when you’re swimming or whenever you’re in competition, you’re simply in competition with yourself. There really isn’t anyone out there. And its you against nature. And when I began to realize that somewhere in that swim, its not how fast you move your hands through the water; you let the water move your hands. And when you can start to tap into the power–like, when you’re boxing, I mean you can tap into your extra-sensory perception and you can put your feed on the ground and you can secure your lower body mechanics–everything in the brains eye and ear begins to slow down and you can create leverage and you can drop your heart rate and things begin to happen inside in a way that you have complete control over your neuromuscular skeletal system. It actually really becomes something else than what we thought it would be. Well, I could listen to you all day. You’re almost poetic. Now tell us, because all of these are a metaphor for life when you translate from the competition and the 22 and a half mile swims you’re doing and things–and tell us about the three pillars you believe in. Well, I believe that you know, we must find that point where more things can turn on in the various nervous systems of the body. And there’s so many different ways that we can breathe to enhance the communication level in the brain. There’s so many ways we can breathe that take care of our cardiovascular system–the drive of our heart. There’s so many different ways we can breathe, that were constantly reducing inflammation in the gastrointestinal organs which mean that were using less energy per day do digest and eliminate and assimilate our nutrition. And when we use less energy to digest, the gut then sends more energy up into the brain and the whole goal, really, is through the breathing, how do we turn the brain on fully? And I think most of us are scared initially by how powerful the breathe can be, and how powerful our brain really is when you turn it loose. So for me, its about teaching folks, initially, to connect with their most powerful energy source–potentially which is their next income. And do you want to breathe deeply, do you want to breathe slowly–do you want to have control over your internal neurobiology and your external environment that you’re in. And if you want that, I think there’s the opportunity for all of us to do that. So connecting with different types of breathing concepts and strategies and techniques, I think, is a wonderful place for us to want to grow mentally. And you believe that this is actually effecting the neuroplasticity in your brain–the actual re-wiring of your brain if you’re doing this on a regular basis. Yes. As a culture, I think that one of the chronic problems we see is the mild hyperventilation through our mouth. We see a lot of people breathing through their mouth and they’re constantly tired–they’re constantly exhausted–they’re in adrenal fatigue. You know, if you think about it, every animal on the planet is breathing through its nostrils in its natural state. Now, if its in a hunting state or is trying not to become someone else’s food, it would be natural to breathe through your mouth and bring up a lot of Cortisol, and spike the heart rate up, and either get what you need or not become someone else’s meat. But were all one: nostril breathing. And every animal on earth is breathing through its nose its entire life as long as its in its natural environment that it is brought up with from its past generation. In other words, we can take an animal, we can take it out of its natural habitat and move it into somebody’s house or another neighborhood, and that animal could pant because its not in its natural environment. Its in a domesticated situation. But when we look at the nostril breathing and how Number one in nostril breathing actually allows the brain to secrete nitrous oxide and nitrous oxide is a natural anti-inflammatory reducer, so its easier to send more oxygen through your nervous system and your bloodstream with a lower heart rate. When you look at the breath coming up in the sinuses first, and how it effects our cranial nerves–these 12 pairs of nerves that place a huge role in regard to our peripheral nervous system–our sense of what’s going on outside of us. If you look at our first cranial nerve, basically our sense of smell, our second cranial nerve and third and fourth is the activity around our eyes–you know, are we safe in this environment? And you gradually work your way through your law jaw. And your teeth and your tongue–and you finally make your way back biggest nerve–which is the 10th cranial nerve, and there’s a lot of really good science out there today in regard to nostril breathing activating the biggest nerve so that we become dominant in raising the quality of the vegas nerve in regards to slowing aging. So were nuances and synapses of the brain. So were never stalling, were never engaging the brain any faster than we need to. As vegas becomes more dominant, the diaphragm muscles, the muscles of inhale, become strong. This takes care of our cardiovascular system. So were never aging the heart system and the various parts of the heart that go beyond where we are in our chronological birthdate. And as vegas becomes stronger, were activating our entropic nervous system of the gut where 95% of the serotonin and 50% of the dopamine–2 very powerful neurotransmitters–are involved in regards to keeping the brain vibrant. Lets say we’ve got people watching here at differentbrains.com and they want to start to take advantage of this. They want to get into it. What’s the best way for them to go about it? Well the first step would be to notice in our daily routines when you’re mouth breathing. When am I mouth breathing. And when you notice that the mouth breathing is in-effect. Breath is passion. Gently correct your breathing, and on the next breath, inhale as slowly as possible, diaphragmatically through your nostrils and watch what happens to your thoughts, watch what happens to your visualizations you have in your brain, and then watch what happens with you physical posture of your low back. Because you’ll notice that when you inhale as slowly as you can through your nose, the pace of your thoughts and the pace of the imagery that you’re watching in your brain slows down slightly. And as this slows down slightly, it gives you a greater opportunity to maybe enhance what you do well–maybe let go of a memory or a thought form that you know no longer serves you or just simply be in a reflective moment without really doing anything. Just being a human being. Just slowing down a little bit. So when you slow this inhale down, now only does it have an amazing neurological effect on slowing easier the brain and opening up the feeling centers of the gut–but it also provides wonderful support in your low back. Because the diaphragm is a deep muscle. And as an athlete, as a corporate executive or someone who is up on their feet all the time or getting up and down–this diaphragm is such a deep muscle it plays a huge role in slowing aging of the spinal column and as with age, we lose the straight spine that we had. But the diaphragm is a wonderful muscle that creates stability, function, form in the low back. And the low back is healthy–being able to have the ability to reduce any inflammation, waste, mucus, fat–from the digestive organ, while at the same time–this straight spine–this is the opportunity to be neuroplastic in the brain any time we want to. Now what if someone in our audience wants to work out with you–wants to attend sessions with you. How would they go about that? Well, you can contact me at www.edharrold.com or you can email me at Ed@EdHarrold.com and I work with people all over the country–whether it be individually, or whether it be with athletes or CEO’s or their teams–but its really all about being in a position where you can amplify your skills that you have in the brain. Always see the bright side of life. Always see the needle in the hay stack. Never ever quit, because life is a series of setbacks. Its one step forward, 2 steps back. It’s basically, how bad do you want it? And those of us who can hang in there in moments of stress or anxiety or inferiorities–and we can just basically sit back and say, ‘ You know what? When stress comes, that just simply means I’m going to learn something new. I learned to have an opportunity here to be creative. Something is going to change for me. Because you have to understand, Hackie, that stress is designed to help us. Its designed to help the brain grow. Its designed to help us manage our emotions so that your emotions don’t manage us. But somewhere along the line, we got into the psychological thinking that stress is bigger and badder than us, and somehow, were never going to measure up to the outer-worlds expectation, or the expectations that we have ourselves in our heart. But stress is designed to help the human being. And the more relaxed you are through breath, controlling your breath–and the lower heart rate you have when stress arises and you become aware that you’ve left your path–were not in the center of the road anymore–the greater ability you have to reshape your perception of that thought form or that image that’s in your brain. Ed, I remember when we were all there at the Aspen Brain Lab, and you were up there and had us take a break at start breathing–and there was something about the ratio of 2 to 1, where you inhale through your nostrils for a count of 8, as I recall, and then you exhale for a count of 4. Now that’s perfect, but we want to reverse that. We want to inhale for a count of 4 and exhale for a count of 8. So I had it backwards? Well, you’re still right there. So inhaling for four, you know, we can always exhale twice as long as we can inhale–but were not used to exhaling in this stress-filled world that we live in. You know, our exhale is really being short-changed, and we have a different time in calming the central nervous system down–you know, keeping the nervous system in balance. So, you know, most folks aren’t exhaling. So when you inhale 4 and exhale 8 there are some really good things that are happening, scientifically, in regard to allowing you to relax and feel and then decide what the next thought should be. Would you care to demonstrate maybe to our viewers who may be at home, want to do it along with you? Yeah. So if–for those of us that are at home and safe–don’t do this in a car driving. If you’re ready, its easier to do this–just let your eyes close a moment and then relax your lower jaw and your lips. Sit up as tall as you can and just notice how you’re breathing right now without controlling the breath. And when you’re ready, inhale as slowly as you can through your nostrils, and as you’re inhaling, Id like you to count until your lungs are expanded as full as they can go. And then, begin to exhale slowly through your nose and try to allow the exhale number to grow longer than your inhale number. Now you might not Be able to inhale 4 and exhale 8, you might be able only to inhale 3 and exhale 6, or 2 and exhale 4. just notice what it’s like to stay on the exhale muscles longer than your normally do and then not rush the next inhale. But just go through a couple of rounds on your own here, where your intention should be inhaling as slowly as you can through your nose, inflating the lungs to their capacity. And then on the exhale, see if you can double the length of the inhale. Well I just did a couple of rounds there and I feel like I went to the Bahamas. I feel good. And that was just a little, little bit of this. This is amazing stuff because it works and its good and its so helpful. Well, anyone who is alive could take this on. All of us–if you’re alive, you’re breathing. It doesn’t matter your level of intellect, it doesn’t matter any of the normal restrictions we have in regard to our medical interventions. This is a wonderful tool to help turn the brain on. To help turn the heart on. To turn on the wisdom of the gut, and the second brain of the gut, in regard to integrating some of the deeper sciences that sometimes are missed when were on the surface of our accomplishments. So as soon as you begin to bring your attention to your breathe. The neural chemistry begins to change. And I think it allows for a much deeper dialogue–a much deeper inquiry in regards to who am I, where am I, how do I get here, what is my intention, where am I going–you know its really all about–you know, I have this choice that I’m going to make right now. And in this choice that I’m going to make right now. the idea here is knowing your blind spots. Knowing your blind spots. How much are we aware of in every choice we make. Every choice we make has blind spots. Its simply the way it is. And don’t wear on Monday what we wore the day on Sunday. But right now, your most aware of your mental and emotional intelligence at the highest point. If you’ve ever been, in your entire life, regardless of what your mind is telling you, right now you’re better than you’ve ever, ever been. And slowing your breath down has an amazing way of shutting off the inner thinking. Shutting off that self-sabotage and giving yourself permission to get out of your own way and maybe trying on a new thought form, or a new work out, or a new way to communicate with a co-worker so that were all in this together and were all finding value and growing together. Ed, I know that you have workshops for different groups–do you have work shops specific for those of us whose brains might be a little bit different–say people with autism, as an example? Or pick any entity you want, or any so-called label–do you have special work shops for different groups? Yes, there’s special workshops for folks with post-traumatic stress disorder, ADD, ADHD, all of the other alphabets that come with it that are basically—where were looking at folks with more anxiety than most of us. And when were filled with anxiety, we need to—I start with breath, and rebooting the autonomic and bringing up a stronger vague tone. And in that, we take care of the cardiovascular system and as we take care of the cardio system, its easier for us to work with the different psyches going on in the brain at any given time. So a lot of the work that I do with is stress-related, whether its interpersonal, outer-personal, business stress—but it really is just allowing the breathe to help us see the best in ourselves where we might have a thought that devalues our goodness as a human being. I would like you to go over how our different brains viewers can get ahold of you. All right. Ed, it’s been such a pleasure. Thank you so much for taking the time to enlighten us. Well, Hackie, you’re an amazing human being and the journey that you’ve chosen to go on in this lifetime—to serve humanity, to serve others, make the world a better place—to maximize the time you have in your body—touches all of us out here in the healthcare field and I cant thank you enough for sharing my vision and my passion with your community today. Good luck to you! Harold Reitman, M.D. 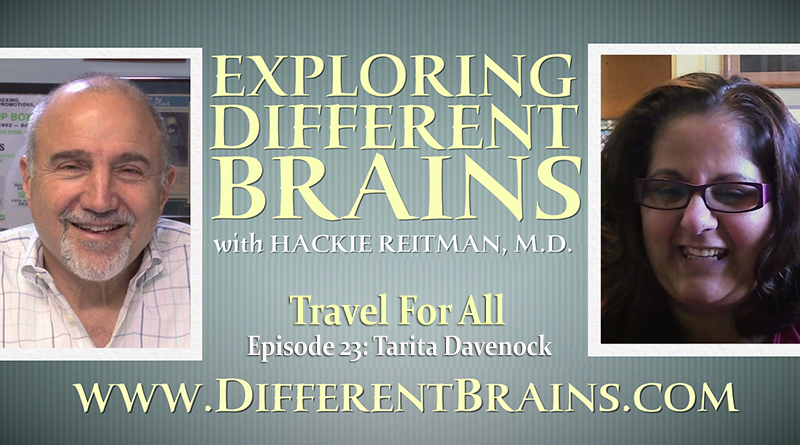 speaks with Tarita Davenock, founder of Travel For All- a full service travel agency specializing in accessible travel. In this episode, Harold Reitman, M.D. speaks with educator, pianist, and music therapist Martha Summa. 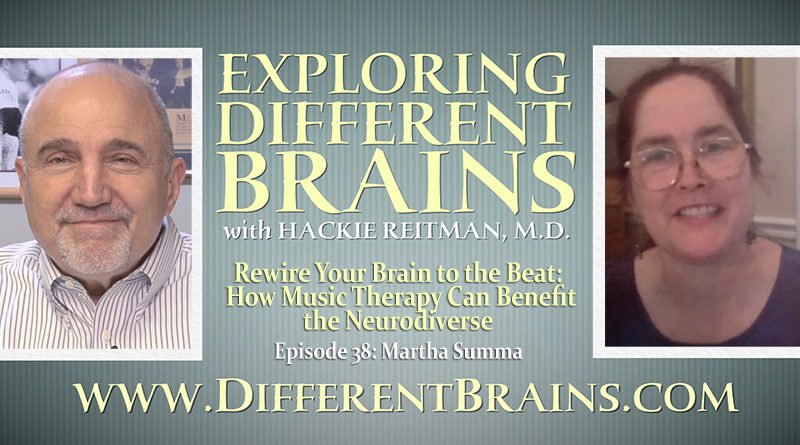 Martha discusses music’s ability to aid in the rewiring of brains via neuroplasticity, as well as her own amazing successes as a therapist. 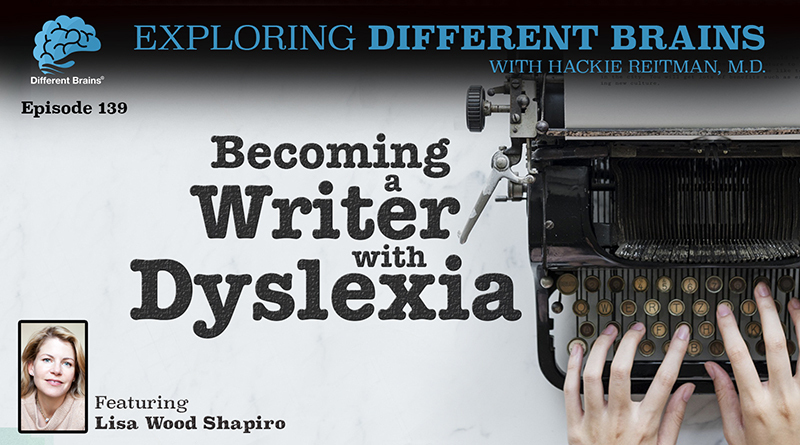 (22 minutes) Dr. Hackie Reitman speaks with Lisa Wood Shapiro, who discusses writing for publications like Wired and Vogue while battling the challenges related to dyslexia.